The recipe I tried was an Idaho Potato Cake. 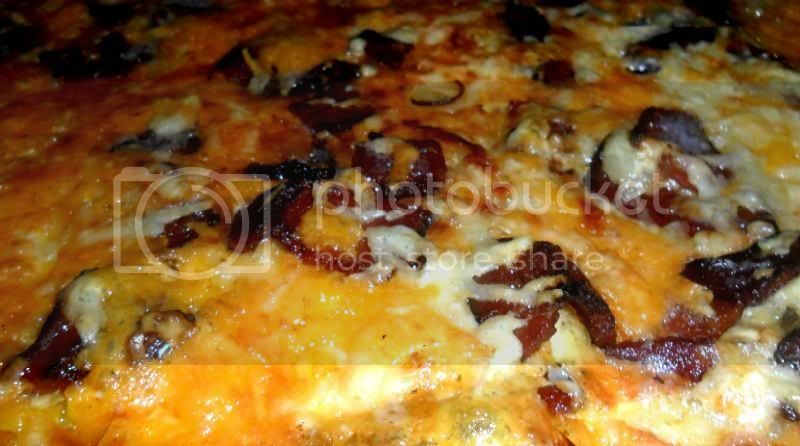 It reminds me of a quiche in a way, but it's in a little more "stick to your ribs" category. It's kind of a long process, but worth it. 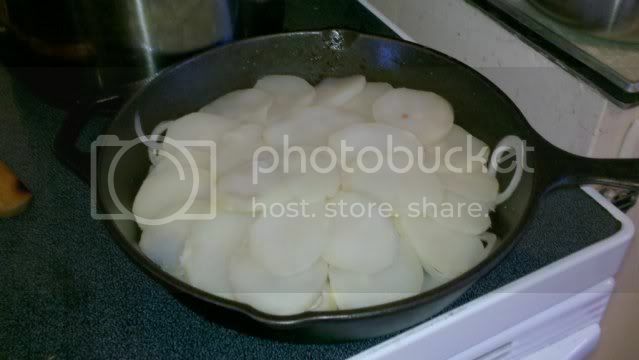 Cook potatoes in a large pot of boiling water until tender, about 15-20 minutes. Drain, pat dry, and slice very thin. Set aside. 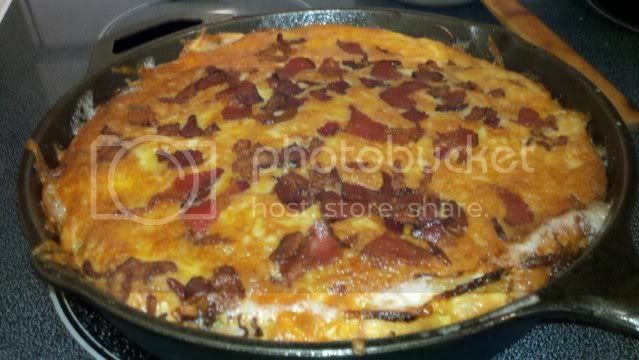 Place bacon in large skillet over high heat, cook 6 minutes. Reducer the heat to medium and cook until bacon is browned and crisp, about 2 minutes. Remove bacon with slotted spoon and set aside. Pour bacon drippings into a cup, add butter, and stir until the butter melts. 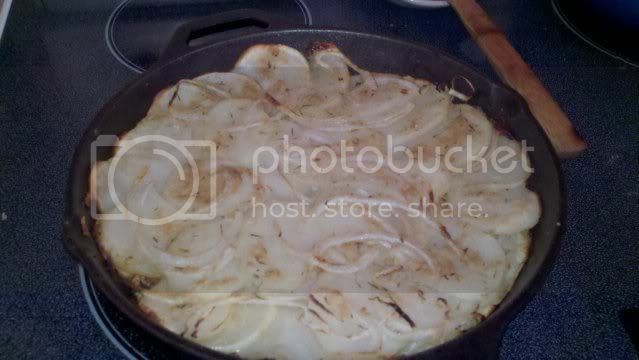 Layer the sliced potatoes and onions in a large skillet, starting with potatoes and alternating the layers. Sprinkle choice of seasoning on every layer of onions. About 6 layers in all. 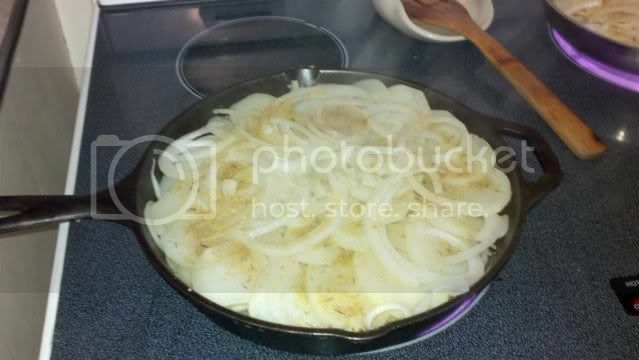 Pour bacon/butter mixture over the potatoes and onions. Place skillet over high heat and cook for 5 minutes. 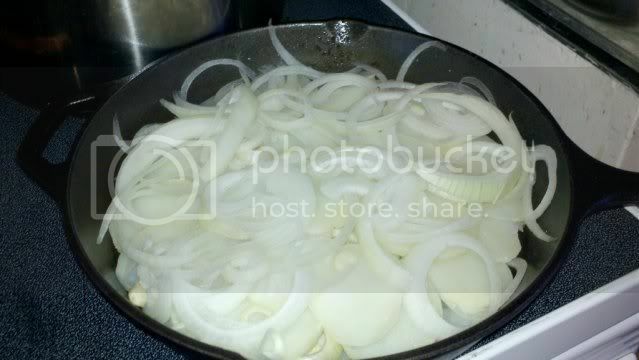 Then place small skillet on top for weight, cook about 7 minutes. Remove the top skillet and cook until the bttm is crisp. About 3-5 minutes. 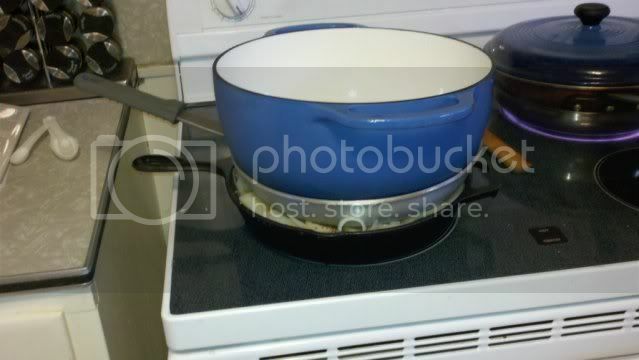 Transfer skillet to oven and bake for 15 minutes. Meanwhile beat the eggs, cream, and a dash of seasoning in a small bowl until frothy. Remove potatoes, reduce oven to 350*. 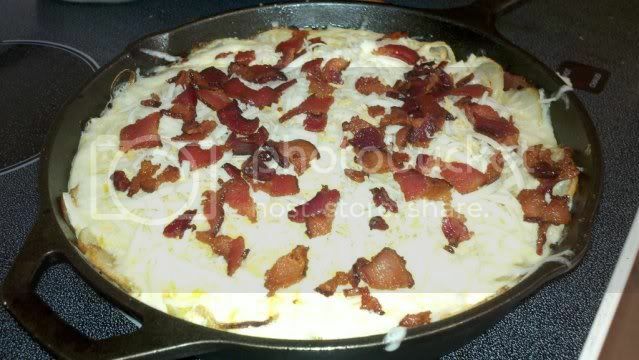 Pour egg mixture over cake sprinkle bacon, and cheese over top. Bake until cheese is melted, about 20-25 minutes. Next. put it back in to the oven for about another 20-25 minutes. Damn! That's looks fantastic. 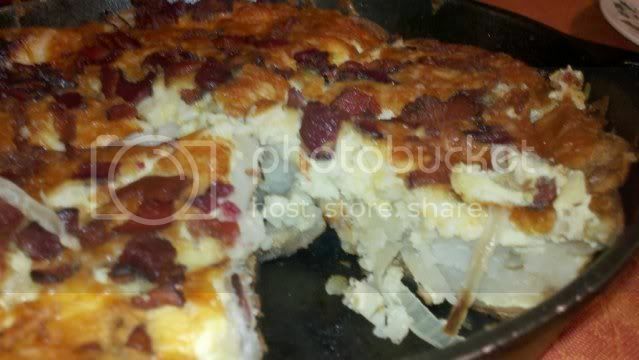 It has it all, taters, onions, eggs, bacon. I'd slather that in Tabasco sauce and eat the whole pan. Yum! I'd love to hear more about the enameled pot. Please do tell. Awesome looking dish! 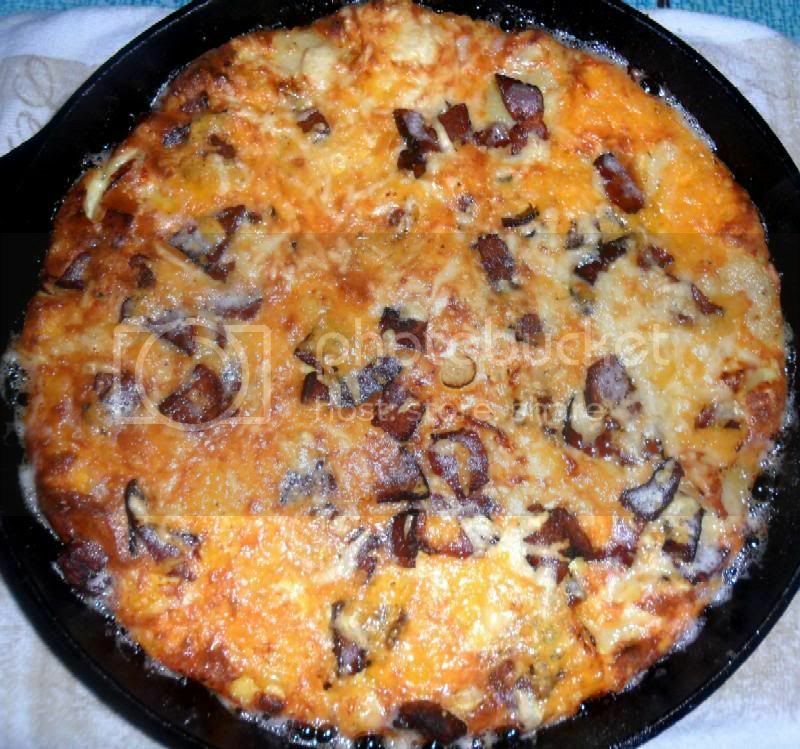 Kind of a cross between a quiche and scalloped potatoes. Sure does look tasty...I'm going to want to try this one. The enamel pot is a Lodge cast iron pot. I think I got it from Wal-mart but not positive. I love this thing,it works good for almost everything. It also seems to stand up pretty good to abuse. My kids do the dishes mainly and are pretty rough on things, so it did get a chip in it but I'm sure that is the reason. Ya gotta check them out, heres a link for ya guys. The enamel pot is a Lodge cast iron pot. I think I got it from Wal-mart but not positive. I love this thing it works good for almost everything. I have a couple of Lodge pots that I use a lot...They are cheap to buy, and tough as nails. My Dutch oven is my favorite. This will be served at Casa Hoser tomorrow evening. well how was it bud??? and here we go ~ since the preparations have already been covered very well, i simply chose shots of the potato cake when it was finished. for some reason, possibly the steam, i couldn't quite get a good focus on this shot. i took maybe half a dozen pictures, but this one was the best. even with the slight lack of focus, you can see just how good this is! this turned out very well, considring the humble ingredients we used, including cheap (but still hardwood-smoked and thick-sliced) bacon, our own potatos that we grew last year out at my parents' place and so on. even the cheese looks really good, in spite of it being the cheap, end-of-the-pay-period, store-brand cheese that i used. we used equal amounts of cheddar and mozzarella cheese for this, and while i prefer my cheese to be a little more toasty-golden-brown, this was very good. 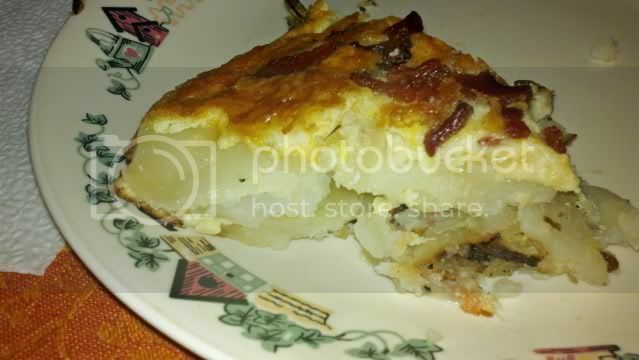 we got three layers each of thinly-sliced potatoes and onions in this cake, and a little leftover bacon to make a small layer in the middle. each layer had its own qualities; the lower ones, closer to the heat, were crispy-browned and savory while the upper ones took advantate of the egg and cheese mixture in order to produce a wonderful, gooey mess. all-in-all, this was a great meal that even had mrs. tas finishing everything on her plate. i am sure that this will be made again in casa de tasunkawitko! one thing i've noticved is that if you get the potatoes on, you can get the rest of the prep work done (onions sliced, bacon browned, cheese grated etc. in just enough time for them to finish boiling. afer that, all you have to do is drain, dry and cut them, and you're good to go! I'm gonna be making this soon. I think I'd could eat the entire pan in one sitting. believe me, you will want to - this is some great stuff! Ron, that looks great! I bet that could be done in a dutch oven. Will try this next weekend as I have a new D.O. to season. Sounds like just the thing. hey, jeff - this can most likely be done in a DO. i can't see any reason why not ~ let us know how it goes and get a pic if you can! Breakfast today was this - using our garden-grown potatoes, maple-cured smoked bacon and cheddar cheese, seasoned with Rich's awesome spice blend, available at www.madhunkymeats.com. It was awesome as always, and I can't thank Jerod enough for sharing this! 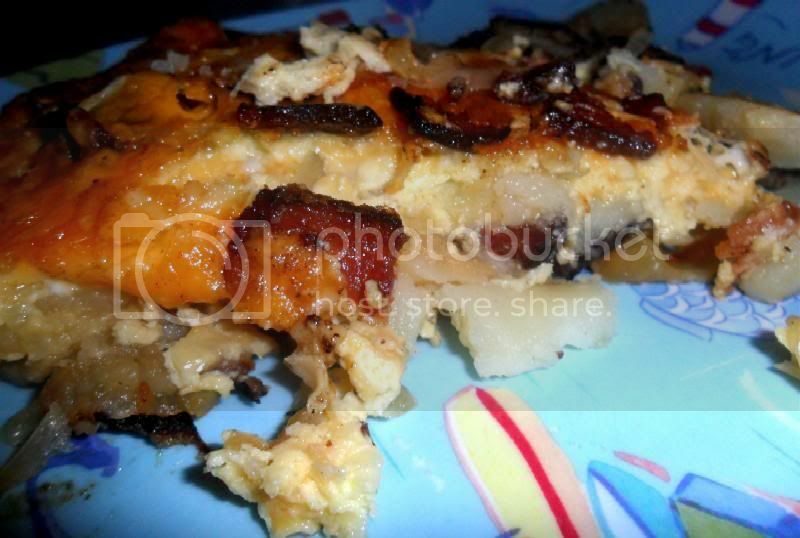 I highly recommend that potato cake Mark....sit down with that and a bottle of hot sauce and you're in hog heaven. I've made it several times and never get tired of it. Dave, is it ok if I have a bottle of beer instead? Yea I know, but I couldn't help it!